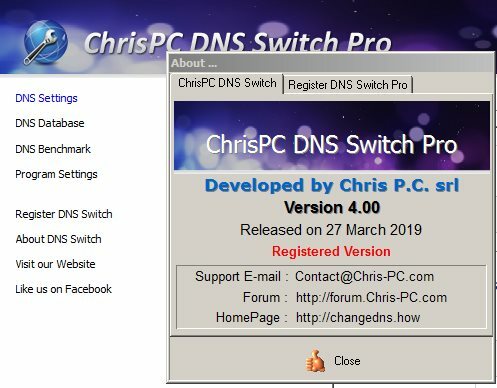 ChrisPC DNS Switch Pro - небольшая программка для Windows, предоставляющая простой и удобный пользовательский интерфейс для выбора сетевого адаптера/карты и изменения связанных с ней DNS-серверов. Имеется возможность выбора серверов как из предустановленного списка, так задать персональные адреса. Например, такое может потребоваться, если вы хотите ограничить доступ своих домочадцев к опасным сегментам сети (с информация о насилии, наркотиках, взрослые материалы и т.д.). 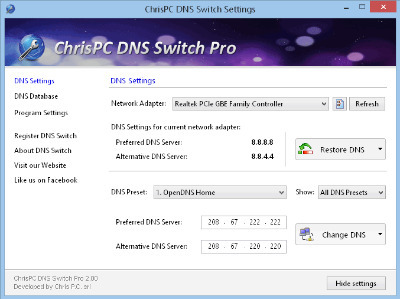 ChrisPC DNS Switch is an easy-to-use tool for changing your PC DNS server, perhaps improving your security, privacy, and internet performance. Launch the program and it displays your current DNS settings. If you know which alternative server you want to use - Comodo SecureDNS, say - then all you have to do is select it from the "DNS Preset" list, click Change DNS > Yes. Your settings will be updated, and you should be able to use them immediately (although it might be necessary to restart your browser). The "DNS Preset" list includes 30+ servers - OpenDNS, Google, Norton, Yandex, DynDNS and more - so the chances are you won't be familiar with at least some. Choose a filter like "Secure", "Family Safe" or "Anonymous", though, and ChrisPC DNS Switch will display only servers of that type, a useful time saver. You're not restricted to the built-in DNS servers, fortunately. Click "DNS Database" and you're able to add or edit custom servers of your own, as well as deleting any of the standard presets which you're sure you'll never use. If you choose a server and it doesn't work as you expected, then a comprehensive "Restore" option is on hand. This can restore the previous DNS server, or the initial one (the settings as they were at installation) for both the current, or all network adapters, in a couple of clicks. Added new fast and secure DNS servers: Cloudflare, Quad9, Verisign, NeuStar, ClearBrowsing, Adguard, Blockaid, DNS.Watch, Fourth Estate, Uncensored DNS. Added support for Windows 10 version 1809 (2018 October Update) and Windows version 1903 (2019 April Update). You can change the DNS from any standard user account on Windows 7 and higher. Improved DNS benchmark speed detection.